We know that buying a home is a big expense. We have also heard many times that the purchase of a home, will most likely be the largest purchase most people will make within their lifetime, but while most people tend to stay focus on the purchase price, and the principle and interest I would like to point out a few other expenses to consider as well. Home Insurance- it is not surprising that most lenders require homeowner’s insurance. Keep in mind, the cost will vary, and factors used to determine your home insurance cost will include, deductible amount, location of the home etc. 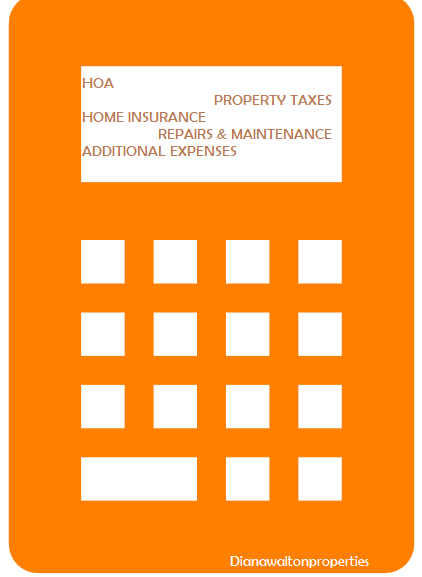 Homeowners Association -Your monthly fees for HOA can vary in price from as little as $30 a month to more than $1,000. Before you purchase your home in an area with a HOA, find out if the HOA is voluntary or mandatory and what the fees are. Your agent can help you with this information. Property Taxes – when you are figuring out how much mortgage payment you will be comfortable with, you must include property tax cost well. Some buyers focus only on the principle and interest, leaving out the property taxes. Also, it is “not” a good idea to use the previous homeowners tax bill, because they may have used exemptions such as seniors, or veteran’s disability, that you may not qualify for. Repairs, and Maintenance -Repairs and maintenance are on going expenses you will need to take into consideration as well. While furnishing your new home maybe a onetime expense, the cost to upkeep your home will be ongoing. As a Houston Real Estate Broker, I always take the time to discuss with clients the various costs associated, with not only buying their dream home but, maintaining it as well. I hope you find this information useful.